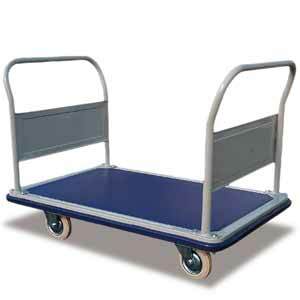 Lightweight, corrosion-resistant, aluminium platform trucks have a clean appearance and are built for heavy-duty use. 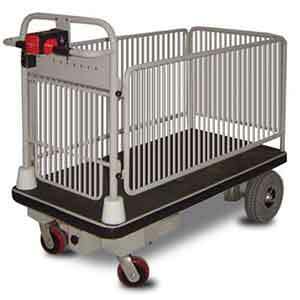 Ideal use in the front office, stock room, warehouse, dock area or laboratory. 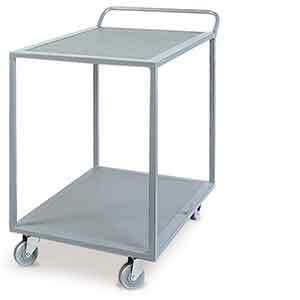 Unitized box frame is made of high strength fully welded aluminium channel with heavy duty deck. Low maintenance non-slip vinyl deck. Welded handle (handle does not fold down). Handle height is ergonomically designed. Rubber bumper around platform to avoid damage to walls. 200 mm diameter black rubber/spoked rim. Two swivel, two fixed. Handle folds down for transportation. 125 mm diameter grey rubber. Two swivel, two fixed. 100 mm diameter grey rubber. Two swivel, two fixed. 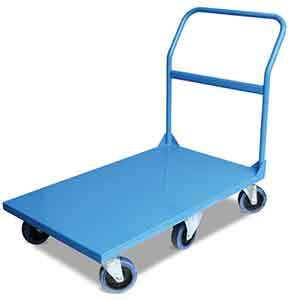 Single tier heavy duty platform trolley. Handle does not fold down for transportation. 100 mm diametre grey non-marking rubber. Two swivel, two fixed. 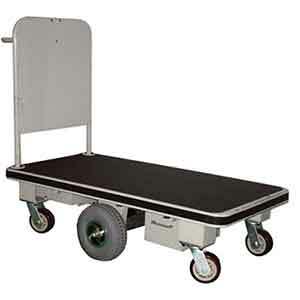 Single tier heavy duty platform trolley (six castors). 150 mm polyurethane on nylon, six swivel, two fixed. 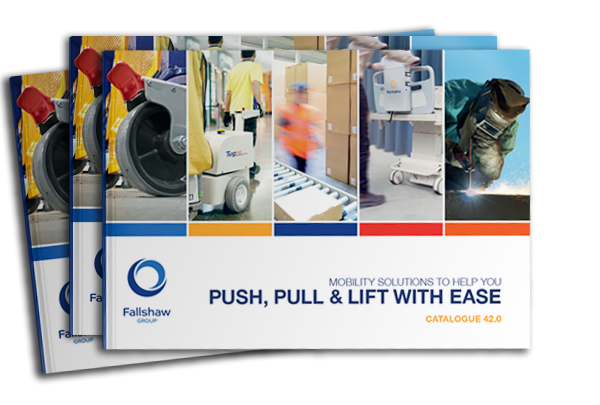 A powered drive system, eliminating the need for heavy manual pushing. 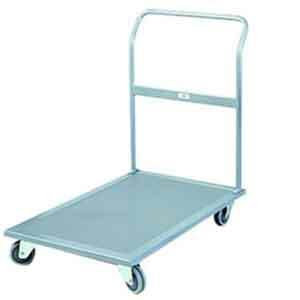 250 mm diametre semi pneumatic grey non-marking drive wheels 125 mm non-marking polyurethane castors. 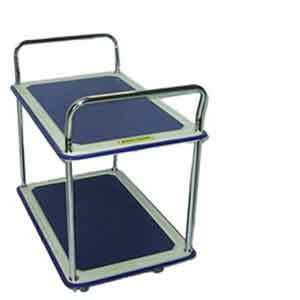 Ideal for use in laundries, hospitals and large retail companies. 250 mm diametre semi pneumatic grey non-marking drive wheels. 125 mm non-marking polyurethane castors. 240 volt rechargeable 12 volt battery. 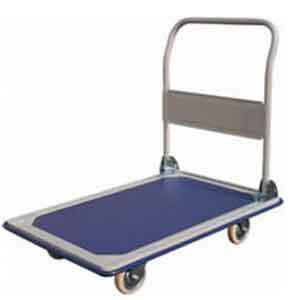 An ideal trolley for confined spaces or narrow ailes as it is highly manoeuverable and pivots on its central drive wheels. 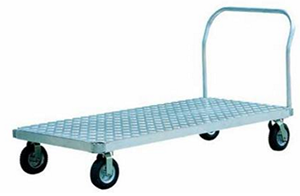 It has a 400 kg capacity and a large deck complete with a rubber mat making it suitable for relocating heavy items easily. 250 mm diametre semi-pneumatic grey non-marking drive wheels and 125 mm non-marking polyurethane castors. 250mm diametre semi pneumatic grey non-marking drive wheels. Low maintenance non-slip vinyl decks. Rubber bumper around each tier. 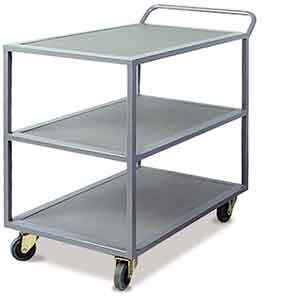 Two tier fully levelled heavy duty trolley. Non-slip industrial mat embedded into top platform only. 100 mm diametre grey non-marking rubber, two swivel, two fixed. 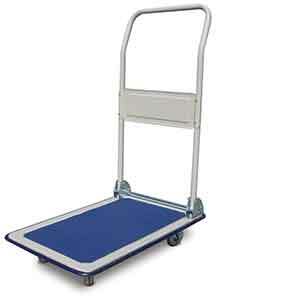 Three tier fully levelled heavy duty trolley. 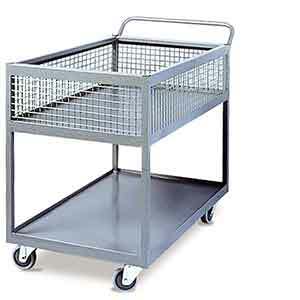 Two tier fully-levelled heavy-duty trolley with half basket. 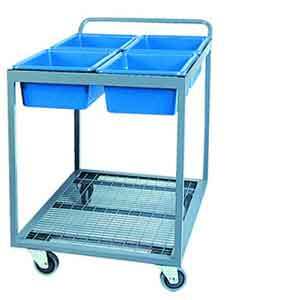 Heavy duty tub picking trolley (tubs included). 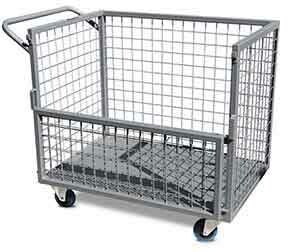 Heavy duty trolley, full mesh with fold down gate.